DC (direct current) arc furnace is a furnace for steel making which represents a different concept in the designs of arc furnaces. Generally DC arc furnaces have single graphite electrode (cathode) and the current flows down from this graphite electrode to an anode which is mounted in the bottom of the furnace. Single graphite electrode exploits the highly efficient heat transfer of the arc generated between the graphite top electrode and the anode provided by the charge of the furnace. It is generally believed that steel making by DC arc furnace is a very recent development. But this is only partially true. In 1878, Sir William Siemens used a DC arc furnace with a vertical graphite cathode, with the arc transferred to the melt in contact with a water cooled bottom anode. Hence the concept of operating an electric arc furnace (EAF) is more than 130 years old but only in early 1970s did the costs for rectification units have drop due to the development of high power solid state rectifiers and only after it DC arc furnaces became economical. This period was the starting point for the development work for DC arc furnaces for steel making in a real sense. Significant commercialization of DC furnace technology has taken place in 1990s when around 80 numbers DC arc furnaces were built in the northern hemisphere. In DC furnaces the electrical energy is converted into thermal energy mainly by the arc, which is established between the top electrode tip and the slag bath. The top of the electrode is connected as the cathode, and the conductive bottom system is connected as the anode. Typical DC arc furnace configuration is shown in Fig 1. The basic design features are given below. Since DC furnace has only one electrode and hence only one electrode mast arm the top of the furnace is less complicated and there are fewer component to be maintained. The electrode is consumed during the steel making operation and is to be extended by new pieces. Electrode arm is used for regulation of the electrode. Since there is single electrode the graphite loss due to oxidation is lower when compared with AC arc furnace. 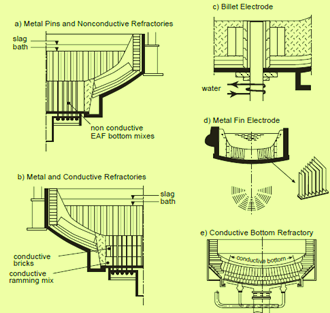 The refractory concept of a DC furnace is to be designed considering the harsher condition in which they operate. DC arc furnaces have special refractories at the bottom because of the anode is installed in the bottom of the furnace. Besides the bottom refractories, other important points which are to be considered for design of the refractory lining are refractory zoning pattern, hearth contour, slag line location, tap hole size and angle, roof orientation, expansion allowances, burner port location, slag door construction and bottom stirring element. The DC arc furnace requires an effective cooling arrangement in the roof and side wall area to counteract the effect of hot liquid slag in direct contact with the refractory material and the increased thermal radiation. The transformers of DC arc furnaces are of different design when compared with the transformers of the AC arc furnaces. A reactor is also added within the DC current loop to take care of the several milliseconds delay between an arc voltage change and the control of the thyristors. In DC arc furnace the high power is supplied from a high voltage 3 phase AC network converted to DC by rectification of the output of the furnace transformer. Rectification is achieved by bridge connected thyristors. The thyristor is normally chosen to hold the current constant. The thyristor controlled rectifiers are capable of continuously modulating and controlling the magnitude of the DC arc current in order to achieve steady operation. For top electrode there are special requirements of graphite and it needs special grade of graphite. The special requirements when compared with the graphite for electrode for Ac arc furnace are given below. Specific electrode resistivity should be lower. It should have enhanced transverse thermal conductivity. There should be improved homogeneity and coarseness. The operation is more stable. The melting is uniform. It has reduced electrode consumption. Electrode consumption reduces to around one third. However there is need to improve the spalling and cracking of the electrodes. Lower consumption of electrodes makes it possible to make low carbon heats. It has lower lining wear. Refractory consumption is less on the side walls but more on the bottom. Overall saving in refractory consumption is in the range of 15 % to 25 %. There is convection stirring of the bath. Temperature distribution of the bath is better. Better temperature distribution results into improved heat distribution. The hot spots on the furnace wall in the case of AC arc furnace are not there. Noise levels are much lower (reduces from 105 dB to 85 dB). Installation costs are higher (around 10 % to 35 % more). Operating costs are lower (around 15 % to 20 % less). There is lesser network disturbance. There is sharp reduction in flicker effect. Flicker level and flicker frequency reduces by half. The need for VAR compensation equipment is much lower. There is lower energy consumption. There is 5 % to 10 % savings in power. Bottom electrodes make the furnace bottom complicated. It has lower levels of dust and gas emissions.